During Colin Powell's long and impressive military and government career, he has served in some of the country's highest positions, including chairman of the Joint Chiefs of Staff. When President George W. Bush (1946–) chose Powell for the job of secretary of state, he became the first African American to ever serve in this position. York, on April 5, 1937. His parents were immigrants from Jamaica. He spent most of his childhood in the South Bronx neighborhood of New York City, which was then regarded as a step up from Harlem. The neighborhood included white, African American, and Puerto Rican residents. Powell has said that he never thought of himself as a "minority" while a child. Despite his parents' urgings that he should "strive for a good education" in order to "make something" of his life, Powell remained an ordinary student throughout high school. At City College of New York, however, Powell discovered his leadership skills after joining the army's Reserve Officers' Training Corps (ROTC). He graduated from the program in 1958 and was made a second lieutenant (an army officer who is below all other officers) in the U.S. Army. He was then assigned to duty in West Germany. In 1962 he met and married Alma Vivian Johnson, with whom he eventually had three children. Powell's next overseas assignment was in South Vietnam. At the time the United States was involved in the Vietnam War (1955–75; a civil war in which anti-Communist forces in South Vietnam, supported by the United States, were fighting against a takeover by Communist forces in North Vietnam). During his first tour of duty in Vietnam (1962–63), Powell was wounded in action. He returned for a second tour (1968–69) and received the Soldier's Medal for pulling several men from a burning helicopter. After his second tour in Vietnam, Powell returned to the United States and studied for a master's degree in business administration at George Washington University in Washington, D.C. He received the degree in 1971, then went to work at the Pentagon, the headquarters of the U.S. Department of Defense and military services. He then moved on to a position in the Office of Management and Budget under the director, Caspar Weinberger (1917–), and his deputy, Frank Carlucci (1930–). These two men were to have a major influence on Powell's career. In the late 1970s, Powell attained the rank of major general (an army officer who is above a brigadier general) and held positions in the Pentagon and Department of Energy. In 1983 he became a military assistant to Weinberger, who was then the secretary of defense under President Ronald Reagan (1911–). While Powell was assisting Weinberger, his advice was sought by the National Security Council (NSC), the agency within the executive branch that advises the president on affairs relating to national security. The NSC wanted to make a secret sale of weapons to Iran in the belief that it would help to free American hostages that were being held in Lebanon by terrorist groups supporting Iran. Powell advised the NSC that the sale was illegal. His opposition helped to establish a reputation for having strong moral character that later served him well and that kept him from being harmed when the NSC's illegal arms deal was eventually exposed. In 1986 Powell was asked by President Reagan to become Frank Carlucci's deputy on the NSC. He replaced Carlucci as national security adviser (head of the NSC) in 1987 and held the post for the rest of the Reagan administration. Arms control and attempts to overthrow the socialist government of Nicaragua were high priorities for Powell and other policy-makers during this period. When President-elect George Bush (1924–) told Powell that he wished to name a new national security adviser, Powell could have chosen to leave the army to earn a substantial income giving lectures or consulting in the business world. However, Powell did not retire. Instead, having been promoted to full general (an army officer who is above a lieutenant general), he took over the army's Forces Command. In this position he was responsible for overseeing the readiness of over a million regular, reserve, and National Guard personnel in the United States. Powell took on more responsibility when he was nominated by President Bush in 1989 to become chairman of the Joint Chiefs of Staff (JCS; the group that is responsible for giving military information and advice to the president, the secretary of defense, and the National Security Council). Powell was the first black officer to hold this post. As chairman of the JCS, Powell played a key role in the December 1989 American military invasion of Panama to unseat that country's military leader, Manuel Noriega (1938–). Earlier in 1989, Noriega, who had been in control of the Panamanian government since 1983, had cancelled presidential elections. Noriega was also involved in the buying and selling of illegal drugs and other unlawful activities. The U.S. government overthrew Noriega in an effort to bring the leader to the United States to be tried on drug charges, to protect Americans, and to give the Panamanian people back their freedom. Television appearances in which Powell explained the purpose of the operation brought him to the favorable attention of the American public. After Powell retired from the military in 1993, he was often mentioned as a potential candidate for president. While many hoped that he would run for president in 1996, he announced in 1995 that he would not do so. Instead, Powell supported George W. Bush in the campaign that led to Bush's election in 2000. On December 16, 2000, Bush announced that he would name Powell as his secretary of state, the nation's top foreign policy position. Powell was the first African American named to this post. On September 11, 2001, anti-American terrorists crashed jet planes into the Pentagon and into the two towers of the World Trade Center in New York City. The attack killed thousands and led Bush to declare that the United States would pursue a "war on terrorism." The Bush administration's efforts concentrated initially on targets in Afghanistan, and Powell's greatest challenge was to build support for the American "war" among Arab and Muslim governments. As the effort to stamp out terrorism continued, Powell was perceived as a force for moderation in the Bush government, pushing for the building of alliances and for restraint when others argued for more aggressive military action. Banta, Melissa. Colin Powell. New York: Chelsea House, 1995. Finlayson, Reggie. Colin Powell. Minneapolis: Lerner Publications, 1997. Hughes, Libby. Colin Powell: A Man of Quality. Parsippany, NJ: Dillon Press, 1996. Powell, Colin L., with Joseph E. Persico. My American Journey. New York: Random House, 1995. Schraff, Anne. 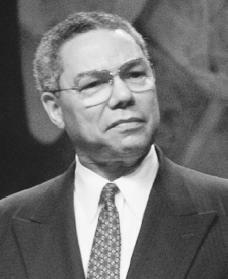 Colin Powell: Soldier and Patriot. Springfield, NJ: Enslow, 1997. Wheeler, Jill C. Colin Powell. Edina, MN: Abdo Pub., 2002.